CloudCheckr's Cost Alerts will automatically notify you of changes in your spend. When triggered, the alerts will notify you via email or other method to help you ensure your costs stay under control. To get started, navigate to Cost > Alerts > Manager. Click Notifications. The Notifications box expands and presents configuration options. Enter an email address to get notified by email or for more advanced notification options, use our third party integrations such as Slack, Amazon SNS, PagerDuty. 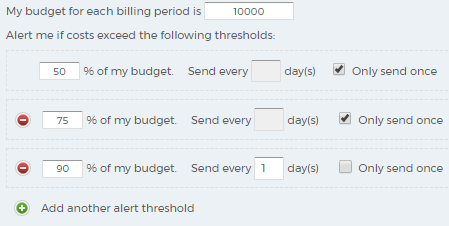 Use the AWS/Azure Costs alert to be notified when your costs go above a certain budget within a specified timeframe. Set budget amount and trigger threshold. Select Accounts (AWS) or select Subscriptions (Azure). Use the AWS/Azure Costs (percent) alert to be notified when your costs fluctuate by a specified percentage when compared to a previous time period. This is the total number of continuous days in which the cost spikes. To trigger this condition, the cost would have to spike in each of the N days. This is the actual amount in a day that the cost can spike. When this threshold is reached, the alert is triggered. This is the the cost spike that occurs, expressed as a percentage when compared to a previous period, e.g. a 25% increase compared to the average spend over the past 10 days. When both Amount per day and Percent average are selected as conditions, the first condition to be met will trigger the alert. Use this to set your reference period for average cost. We take this average cost per day and compare all the trigger conditions against it to see if an alert should be sent. You can set more trigger thresholds if desired. Select how you will monitor costs. By Account (AWS) or by Subscription (Azure) — the alert will look at all the costs as a whole. By Service — the alert will look at costs grouped by service. By Specific Tag — the alert will look at costs grouped by a user-defined tag. Choose your cost type (AWS only). Use the Contract Tracking alert to be notified when you costs exceed or are below a certain threshold. This is especially useful when you want to ensure you have used all of a committed budget by a certain date in order to avoid wasted funds, or penalties for not spending the contract-specified amount. Set the budget for the billing period. Set the trigger for exceed threshold. Set the trigger for under threshold. Choose accounts (optional ? all by default). Use this alert to be notified of any new tag values for a specified tag key. This will help you be aware of any newly-created resources that do not follow already-existing tagging strategies. Use this alert to be notified when your data transfer costs exceed a specified amount. Set the Usage Type threshold. Select either Network In or Network Out. Select a greater than threshold in bytes. Use this alert to be notified before your Enterprise Agreement balance runs out. Enter a number to be notified N days before your balance runs out. Go to Cost > Alerts > Manager. Click an alert to edit it. The alert's configuration window opens. You can enable/disable an alert via the slider. Click to delete the alert. any of your configured notification methods (Slack, Amazon SNS, etc.). the Results screen, located at Cost > Alerts > Results, where you'll find searchable results stored for the life of your CloudCheckr account.